Johann-Friedrich Wessels, Lead Engineer on U-47 during the raid on Scapa Flow, was born on 28 May 1904 in the port city of Wilhelmshaven, home to the U-boat arm. Having joined the Reichsmarine in 1923 and served on a number of warships among them the cruiser Leipzig, Wessels joined the U-boat arm at the beginning of 1937 at the rank of Leutnant zur See. Having been promoted to Oberleutnant zur See, Wessels was posted to U-47 in December 1938. Wessels was to spend four patrols on U-47 from the time of his arrival through to April 1940, and was aboard during the raid on Scapa Flow after which he was awarded the Iron Cross First Class. On New Year's Day 1940, Wessels was promoted to Kapitänleutnant, and following his fourth patrol aboard U-47 served as both a training officer and flotilla engineer with the 1st Flotilla "Weddingen", based in Kiel and then the French port of Brest. Left: Johann-Friedrich Wessels wearing the Knight's Cross, awarded in March 1944. Centre: Aboard U-198 with the legendary skipper Kapitän zur See Werner Hartmann. Right: Bearded after an epic two hundred day patrol in the Indian Ocean. In November 1942 Kapitänleutnant zur See Wessels returned to the sea having been transferred to U-198, one of the newer and larger Type IXD vessels, where he was to serve for one patrol as Lead Engineer under another legendary U-boat skipper, Kapitän zur See Werner Hartmann. Wessels was only to serve one patrol aboard U-198, but this was to be the third-longest patrol in the history of the U-boat arm during the Second World War, lasting a staggering two hundred days. During this patrol, U-198 suffered an attack by enemy aircraft and was forced to crash-dive. Having taken a severe battering from the attack all seemed lost, but Wessels succeeded in getting the vessel back to the surface. Following U-198's successful patrol Hartmann nominated his Lead Engineer for the Knight's cross; he was one of only fourteen Lead Engineers to receive the award. On 9 March 1944 Wessels received the award from Grossadmiral Dönitz, and less than a month after that was promoted to the rank of Korvettenkapitän zur See. 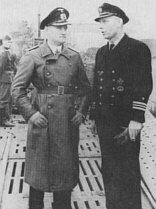 His final patrol was as Lead Engineer on the Type IXC vessel U-870 under fellow Knight's Cross holder Korvettenkapitän zur See Ernst Hechler. After U-870 was sunk two months before the end of the war at the port of Bremen by Allied aircraft, Wessels finally returned to land, posted to the position of Unit Engineer with U-boat Headquarters East. Johann-Friedrich Wessels was to survive the war, and was released from British captivity at the beginning of 1947. He died in 1988 in the city of Oldenburg, Schleswig-Holstein, at the age of 84.